MacVector now directly supports storing primers within a primer database. The Primer Database tool allows you to save and retrieve primers from subsequence files within Primer3 and Quicktest Primer. You can easily create your own primer database, use existing files or import primers from Excel. Many users use subsequence files to store primers, and in fact we have a tool that allows you to convert an Excel spreadsheet into a subsequence file full of your primers. Some of these users have asked whether we could make this easier and also better integrate it better into primer design within MacVector. So in MacVector 14 we have introduced the Primer Database tool. 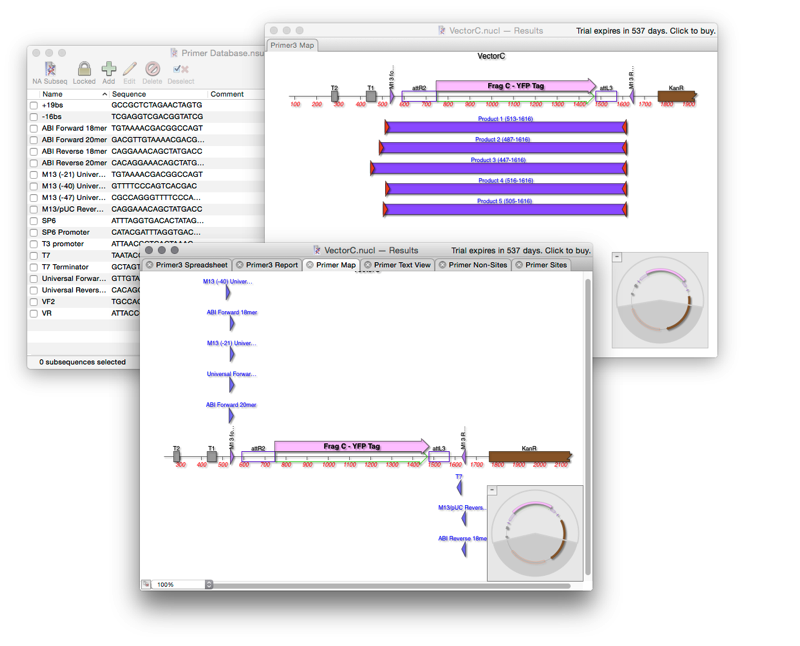 The new tool is integrated within all the primer design tools and allows you to save primers directly from the multiple primer design interfaces to the primer database. 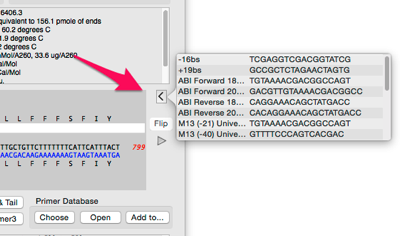 You can also scan your sequences with the Primer Database. The Primer Database is backwards compatible with subsequence files so users, already using subsequences to store their primers, can seamlessly migrate to using the Primer Database. For users, new to storing primers, there is a new Primer Database.nsub file (installed in the /MacVector/Subsequences/ folder) populated with a number of common universal primers. This is used as the default database file, but you can easily choose any file of your own, or add your own primers to this file, or to a copy of it. Primer Database Search – this is a new function in the Analyze menu. It let’s you scan sequences for potential primer binding sites against the Primer Database. It is similar to the Nucleic Acid Subsequence search function, except that it uses Primer Database.nsub as the default search file and has extra settings to simplify handling primers with tails and/or mismatches to the target sequence. Remember that you can easily annotate any result back to your sequence by dragging and dropping from the Results window. Quicktest Primer – this now lets you save designed primer direct into the current primer database and also lets you retrieve primers from the database via a simple popup scrolling menu. In addition, this interface now handles primers up to 200 nucleotides in length. In both interfaces the popup menu is accessed via a new menu. Additional changes have been made to the graphical representation of primer binding sites in both the Primer3 and Primer Database Search results so that the actual sequence of the primer (complete with mismatches and/or tails) is displayed when zoomed to the residue level and if you select and copy the product graphic, the actual product sequence is placed on the clipboard which you can paste into a new document. All of these new features support mismatches and restriction site tails. This entry was posted in Releases, Tips and tagged pcr, primer3, subsequences. Bookmark the permalink. Both comments and trackbacks are currently closed.